Nicknamed the “Oil Country Lathe,” the LOC Series 4-axis lathes are built to thread big pipes with speed and precision. The three spindle bore variations were specifically developed for large diameter pipes. LOC lathes combine variable speed threading and harmonic spindle control to exactly match in-feed patterns with cutting increments. 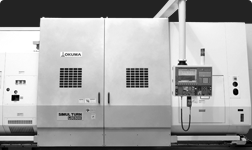 The LOC Series provides the strength, rigidity and power necessary to handle these large oil country workpieces. Options include Okuma’s exclusive Collision Avoidance System. 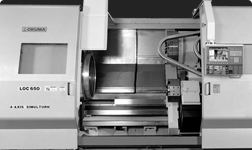 Accurate and efficient horizontal lathe.